In my last post, I outlined a number of new enterprise scalability features: Backup acceleration technologies, full VM restore acceleration technologies and core engine enhancements. Part of the announcement for 9.5 was about the new advanced ReFS integration, which I’ll cover in this post as it is a significant technology for Veeam. Let’s dig in! The final 9.5 feature I will cover today is arguably the most amazing feature of 9.5: Advanced ReFS integration. 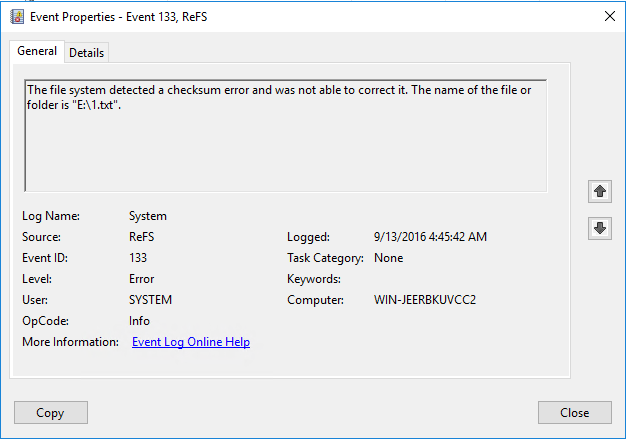 Resilient File System (ReFS) is a new file system of Windows Server operating systems, and the Windows Server 2016 version brings new capabilities that Veeam Availability Suite 9.5 leverages in order to provide some truly incredible benefits. The advanced ReFS integration supports ReFS volumes on internal, direct-attached storage (DAS) and Storage Spaces — both classic and Storage Spaces Direct (S2D). The benefits (explained below) will provide significantly faster synthetic full backup creation and transformation performance, as well as reduce storage requirements and improve reliability. Even more importantly, this functionality improves Availability of backup storage by significantly reducing its load — which results in improved backup and restore performance and enables customers to do much more with virtual labs running off of backup storage. This is a big deal, so let’s explore more ReFS integration. One of the hardest parts of making a backup, and in particular a synthetic full backup, is the transformation associated with moving blocks between different backups files in the incremental chain. Version 9.5 leverages the fast cloning capability in ReFS API to create synthetic backups without moving the data blocks between files, and instead, references backup file blocks already present on the volume. This means all manipulations associated with synthetic full backups are limited to metadata updates and require no actual I/O operations on backed up data. 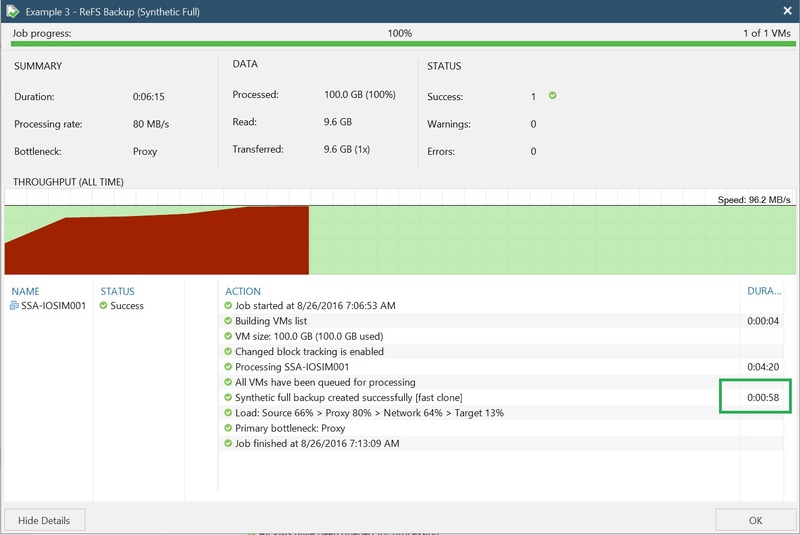 Below is a screenshot of the synthetic full backup being made on a VM backup on ReFS which took only 58 seconds to process three incremental backups. Compare this to over 36 minutes for the same VM backed up to an NTFS volume! Now that synthetic full backup creation and transformation are incredibly fast and not taxing on backup storage performance, you’ll probably want to have more full backups on disk — such as periodic synthetic full backups of primary backup jobs and GFS retention of Backup Copy jobs that can keep a set number of weekly, monthly, quarterly or annual backups. 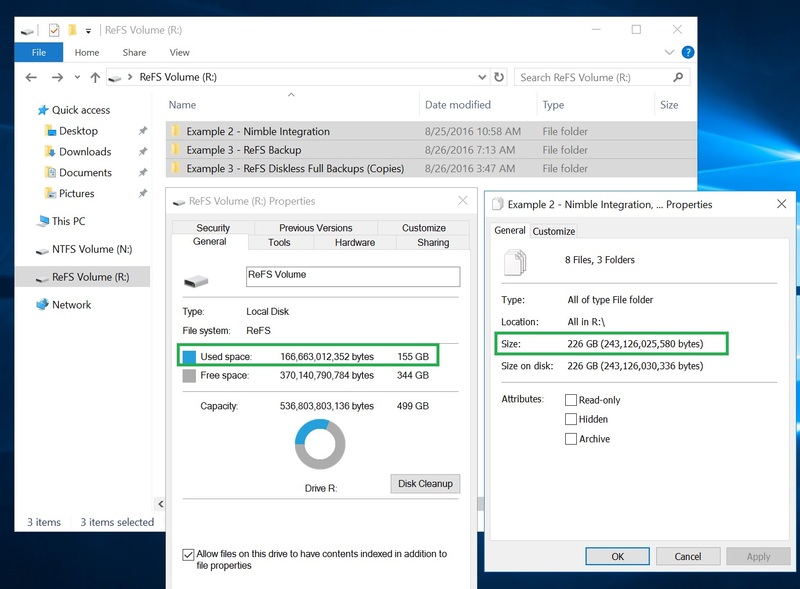 I have some good news for you here too: The spaceless full backup technology brought by the advanced ReFS integration allows multiple full backups on disk to share the same data blocks. Obviously, this means a significant reduction in overall storage capacity requirements for the backup repository, providing storage efficiency rivaling that of some deduplication storage systems, but without the performance impact associated with using those (data rehydration). And what’s best, all you need is a general purpose Windows Server 2016 with a bunch of internal or direct-attached disks — same as the backup server itself uses! How cool is that? While better performance and reduced disk space consumption is important, they are worth nothing without reliability, which is where the last advanced ReFS integration feature comes in to play. Version 9.5 will automatically enable ReFS data integrity streams on all backup files, which are used by background ReFS data integrity scanner to detect and notify you on silent data corruption. This is critical when it comes to ensuring a reliable forever-incremental data archival model for long-term retention. You can think of it as our existing storage-level corruption guard feature on steroids because it will keep verifying your entire archive, and not just the latest restore point. All of that is available on simple ReFS volumes — but there’s even more for those using Storage Spaces, where its proactive error-correction functionality will automatically and seamlessly fix corrupted backup file blocks using a good mirror or parity copy of the affected block from another system, thus maintaining a healthy forever-incremental archive with the required level of redundancy. As far as requirements go, they are rather simple: The backup repository must be installed on Windows Server 2016 (and most often — such as in the case of our backup appliances — it will be the same server as the backup server). This allows the repository to leverage the ReFS API that enables integration features identified above for greater performance and capacity efficiency with large-scale data sets, while ensuring data resiliency of Veeam backup data. Do you agree that our advanced ReFS integration completely changes the game for Veeam users? Let us know in the comments!